The Glitch Mob is a three-piece electronic group from Los Angeles, composed of Ed Ma (edIT), Justin Boreta (Boreta) and Josh Mayer (Ooah). The group, originally a four-piece including Kraddy, was formed in 2006 within the burgeoning Los Angeles bass-driven 'beat' scene that also produced Daedelus, Flying Lotus and Nosaj Thing. 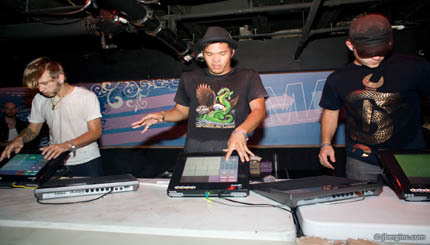 The Glitch Mob made a name for themselves playing live, choosing to perform with laptops and MIDI controllers like the Lemur.